Montgomery County is part of the Houston-The Woodlands-Sugar Land, TX Metropolitan Statistical Area. According to the U.S. Census Bureau, the county has a total area of 1,077 square miles (2,790 km2), of which 1,042 square miles (2,700 km2) are land and 35 square miles (91 km2) (3.3%) are covered by water. As of the 2010 census, there were 455,746 people, 162,530 households, and 121,472 families residing in the county. The population density was 423 people per square mile (163/km²). There were 177,647 housing units at an average density of 165 per square mile (64/km²). The racial makeup of the county was 83.5% White, 4.3% Black or African American, 0.7% Native American, 2.1% Asian, 0.1% Pacific Islander, 7.0% from other races, and 2.3% from two or more races. 20.8% of the population were Hispanic or Latino of any race. There were 162,530 households out of which 36.20% had children under the age of 18 living with them, 59.50% were married couples living together, 10.60% had a female householder with no husband present, 4.70% had a male householder with no wife present, and 25.30% were non-families. 20.60% of all households were made up of individuals and 6.50% had someone living alone who was 65 years of age or older. The average household size was 2.78 and the average family size was 3.22. In the county, 27.60% of the population was under the age of 18, 8.00% from 18 to 24, 27.40% from 25 to 44, 26.60% from 45 to 64, and 10.40% who were 65 years of age or older. The median age was 36.1 years. For every 100 females, there were 98.29 males. For every 100 females age 18 and over, there were 95.94 males. As of the 2000 census, the median income for a household in the county was $50,864, and the median income for a family was $58,983. Males had a median income of $42,400 versus $28,270 for females. The per capita income for the county was $24,544. About 7.10% of families and 9.40% of the population were below the poverty line, including 10.90% of those under age 18 and 10.10% of those age 65 or over. From 2010-2016, 54% of all vehicle-related fatalities in the county were related to the use of controlled substances, including alcohol, marijuana, methamphetamine and synthetic drugs. According to Tyler Dunman, Montgomery County assistant district attorney, approximately 60-70% of all crime in the county is connected to substance abuse. 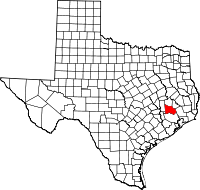 Montgomery County is one of the most heavily Republican counties in Texas, giving 78.1 percent of its vote to George W. Bush in 2004 and 75.8% of its vote to John McCain in 2008. The county has not been won by a Democratic presidential candidate since native Texan Lyndon Johnson won 60.9% of the county's vote in 1964. In 1968, George Wallace, running as a third-party candidate, won the county, whilst in 1948, “States’ Rights” candidate Strom Thurmond had previously won over 29 percent of the vote to make Montgomery his fourth-strongest county in Texas, and in 1992, Ross Perot, another third-party candidate received more votes than Democratic candidate Bill Clinton. In 2016, it was the only county in the United States which Republican nominee Donald Trump won against Democratic nominee Hillary Clinton by a margin of greater than 100,000 votes. Willis Classical Academy The county also is home to two campuses of the Lone Star College System: Montgomery and The University Center. The county operates the Montgomery County Memorial Library System. Lone Star Executive Airport, a general-aviation airport, is located in Conroe. The Houston Airport System stated that Montgomery County is within the primary service area of George Bush Intercontinental Airport, an international airport in Houston in Harris County. William P. Hobby Airport in Houston in Harris County also operates regular commercial service. Montgomery County has several toll roads within its borders, most of which are operated as "pass-through toll roads" or shadow toll roads. Currently, the only true toll road within the county is State Highway 99 until the extension of State Highway 249 is completed. Montgomery County also operates two direct-connect flyover ramps that connect between State Highway 242 and Interstate 45, located in The Woodlands. ^ Annual Estimates of the Resident Population: April 1, 2010 to July 1, 2015, U.S. Census Bureau. ^ "Annual Estimates of the Resident Population: April 1, 2010 to July 1, 2016". U.S. Census Bureau, Population Division. Washington, DC. March 2017. Retrieved March 27, 2017. ^ "Dave Leip's Atlas of U.S. Presidential Elections - Data Graph --2004 Montgomery County, Texas". uselectionatlas.org. Retrieved 22 March 2018. ^ "Dave Leip's Atlas of U.S. Presidential Elections - Data Graph --2008 Montgomery County, Texas". uselectionatlas.org. Retrieved 22 March 2018. ^ "Dave Leip's Atlas of U.S. Presidential Elections - Data Graphs". uselectionatlas.org. Retrieved 22 March 2018. ^ Leip, David. "Dave Leip's Atlas of U.S. Presidential Elections". uselectionatlas.org. Retrieved 22 March 2018. Lonestar College – The Lone Star College System, formerly known as the North Harris Montgomery Community College District, is accredited through the Commission on Colleges of the Southern Association of Colleges and Schools (SACS).